Is that bottom one from the Middlesbrough game where we thought we'd got in the playoffs but actually hadn't? Looks like they have the old lyons cake kit on in that game so that would have been a few years earlier, personally I reckon it's against Brighton, think we had over 12 thousand turn up because when you paid on the door you were given a voucher guaranteeing you a ticket for the everton cup a few weeks later, sithi. Roger Wylde lashes the ball home in front of the Ponty. My first ever game, September 1987, v Plymouth. We went top of the league. Was that a 5-2 game we had a few around that time. Stole was one and I can't remember if the other was Plymouth. The other 5-2 victory was against Reading, old mate. We beat Plymouth 2-1 that day. 2-1. Wylde got two, Tommy Tynan got theirs. The other 5-2 at home that season was Reading (after we'd been 2-0 down very early on I think ). Yep, on closer inspection we do seem to be playing in red shorts. Still, I only ever remember Boro having a light blue shirt with darker shorts. Unless the shirt is actually striped and just a bit out of focus! There's a couple of Plymouth players in the photo with strong Barnsley connections. Mark Smith wearing number six, who was to join us and serve us well two years later, and our former defender Nicky Law trying to block Rodger's shot. Nicky Law is unmistakable. Think he threw his toys out the pram and got booked after an altercation with someone or other. Great spot with Mark Smith though! Never realised it was him. One of my favourite players as a kid. I'm telling anybody who'll listen " wer'e not in them Brighton have scored" one of them is shouting " shurrup we are"
then the announcement " ladies and gentlemen sorry but I have to tell you Brighton have scored etc etc". It was terrible to see all those supporters faces that day. One minute dancing around and singing the next in absolute despair. The emotion the game can stir up in us eh.! Reading and Stoke were both Tuesdays weren't they? I don't think so, JC, but I'm probably wrong, mate. Could we have a nostalgia sticky thread where we can attach all these old BFC related pics? I also remember that, it was mad! Proper gutting. Could never happen in the post-internet age. In my memory, I can see Gerry Taggart spraying champagne from the gantry where the tv cameras are: have I made that up? Its a good job its not in today's social media world, we'd never had lived it down. Its bad enough with all those crying kids they send around when their teams got relegated. Nice memories - but thank goodness most of it has been knocked down and rebuilt. If it looked like that now then Barnsley would be stuck in the conference league. Not many football supporters would tolerate facilities like that now. The reading one was 20th October which was a Tuesday. I remember going on the bus from sunny Darfield. The Stoke one was a Saturday 31st October. Weird I was sure that one was Tuesday. Memories not what they used to be. So we were both right? Now that's a conclusion that suits me, mate! 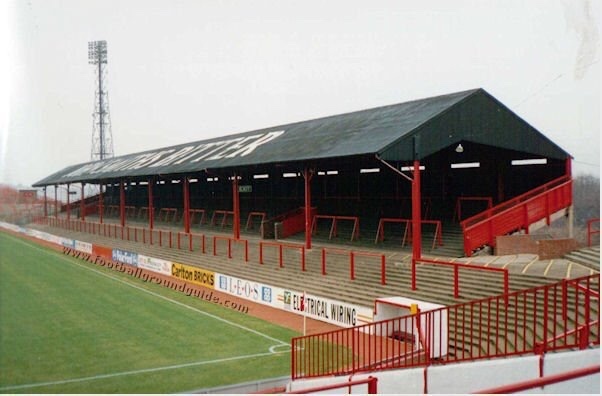 There was wooden terracing?! Healthandsafetytastic! No, you haven't. Some of the players were chucking their boots down as souvenirs as well.